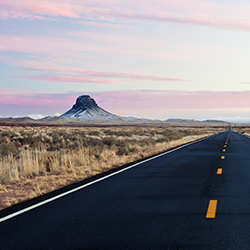 Off the well-beaten path to Arizona’s most popular hotspots, the road less traveled will lead you on an unexpected adventure you’ll never forget. Along the way, you’ll find ghost towns and artist enclaves, ancient villages and surprising landscapes. So come explore and let the road be your guide. 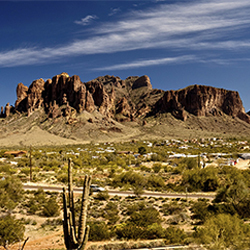 Flanked by the rugged Superstition Mountains, Apache Junction, Arizona, is a desert playground with a historic past, including the legend of the Lost Dutchman’s Mine." 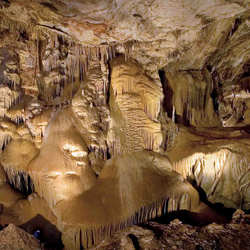 Benson, Arizona, in the heart of Cochise County, holds the living caves of Kartchner Caverns State Park and the peaceful Holy Trinity Monastery. Home of the historic Copper Queen Mine, Bisbee, Arizona – located 90 miles southeast of Tucson – will send you back to a time when the Old West reigned supreme. 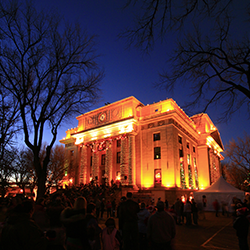 With a preserved turn-of-the-century downtown crowned by a hilltop Art Deco courthouse. 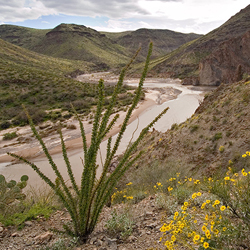 Between Phoenix and Flagstaff, Camp Verde, Arizona, offers wildlife viewing and outdoor recreation along the Verde River, and Montezuma Castle National Monument. Clarkdale, Arizona, offers easy access to Sedona and Jerome, a look at the state’s mining history, and scenic rides on the Verde Canyon Railroad. 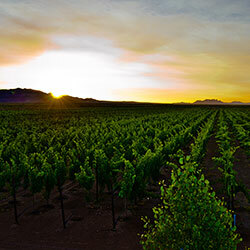 Sample wines of the Verde Valley Wine Trail, take a scenic drive, go birding at Dead Horse Ranch State Park, or enjoy a festival in inviting Cottonwood, Arizona. 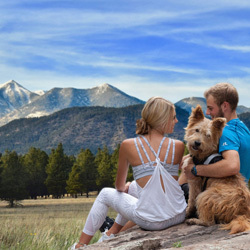 Nestled more than a mile high amid Ponderosa Pine forests, Flagstaff is a laid-back mountain town with an outdoors focus and plenty of charm. The famed “Mother Road,” Route 66, winds through its historic downtown, featuring streets lined with classic diners and historic hotels. 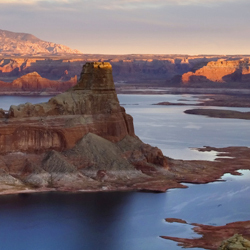 Spread over 1.25 million acres, Glen Canyon National Recreation Area is an outdoor haven, renown for its stunning scenery and geologic wonders, including the ever popular Lake Powell. Set in the foothills of the Pinal Mountains, the Globe-Miami area is made up of two historic towns and more than a century of history. Originally founded as silver mining towns, Globe and Miami are home to lovely turn-of-the-century buildings and fantastic antique shops. One of nature’s most captivating creations, the Grand Canyon forms a colorful chasm more than a mile deep and 277 miles long. Featuring endless scenic vistas, rugged campsites, and remote hiking trails, the Grand Canyon is more than a beautiful sight; it’s a destination that will leave you awestruck. 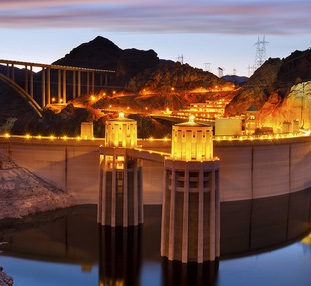 Explore the Hoover Dam, one of the Seven Wonders of the Industrial World, which spans the Black Canyon along the Colorado River between AZ and NV. Located along a steep hillside full of hairpin turns and shocking drop-offs, this old ghost town has life in it yet. 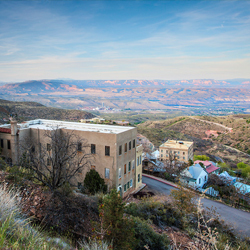 Once called the "Wickedest Town in the West," Jerome was a budding city of brothels and saloons back at the turn of the last century, when copper mining was king. 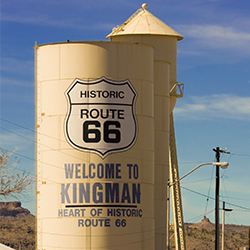 One step into Kingman's classic downtown and you'll quickly get a sense of how this cherished little town began as a gold and silver mining town in the late 1800s. 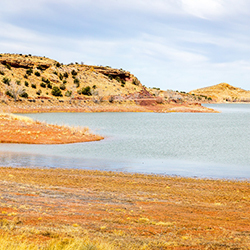 You'll also see how its charm reaches beyond that as a stop along the famed Route 66 and a great place for outdoor activities like golf, hiking, and biking. 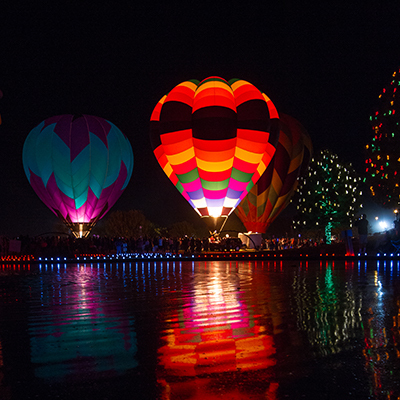 There's a reason everyone from spring breakers to families visit Lake Havasu each year. 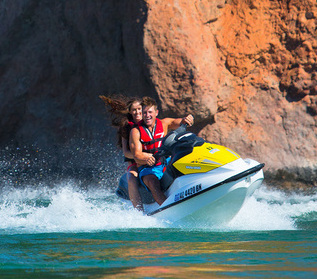 With incredible water sports like waterskiing and house boating, to the easygoing lakeside lifestyle and water tours like The London Bridge, Lake Havasu is an exhilarating getaway. 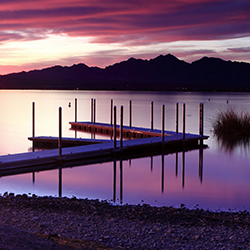 Discover miles of shoreline and reliably sunny skies at Lake Havasu State Park in Lake Havasu City, Arizona. Perfect for swimming, boating, hiking, and camping. 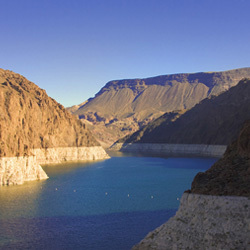 Play in the water of Lake Mead, Arizona, the United States’ largest reservoir. Fishing, water sports, and boating await. Miami, Arizona, and its sister town Globe, are perched in the heart of Arizona, with access to great outdoors and even greater antiquing. 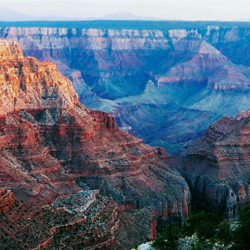 Want to add one of the grandest landmarks in the United States to your “visited” list? 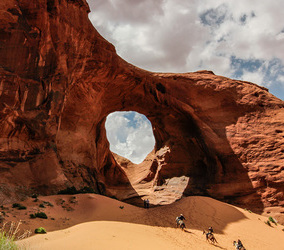 Visit the surreal sandstone towers in Monument Valley Navajo Tribal Park. As a quaint gold-mining town, Oatman welcomes its visitors with a Wild West charm and friendly burros that roam freely in search of gifted carrots and treats. 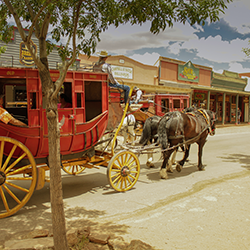 The turn-of-the-century hotels and shops decorate the town's streets further giving a truly authentic Western feel. 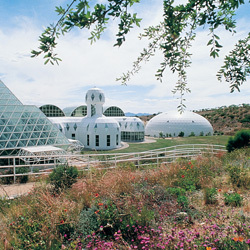 The Southern Arizona town of Oracle offers guest ranch experiences, a zipline and other outdoor activities, futuristic Biosphere 2, and Oracle State Park. 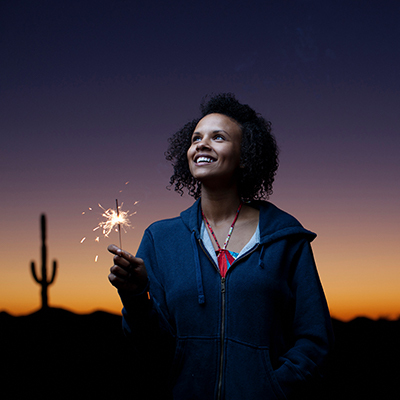 After a glorious desert sunset, watch the stars light up the sky. Oracle is an official Dark Sky Community and excellent place for stargazing. 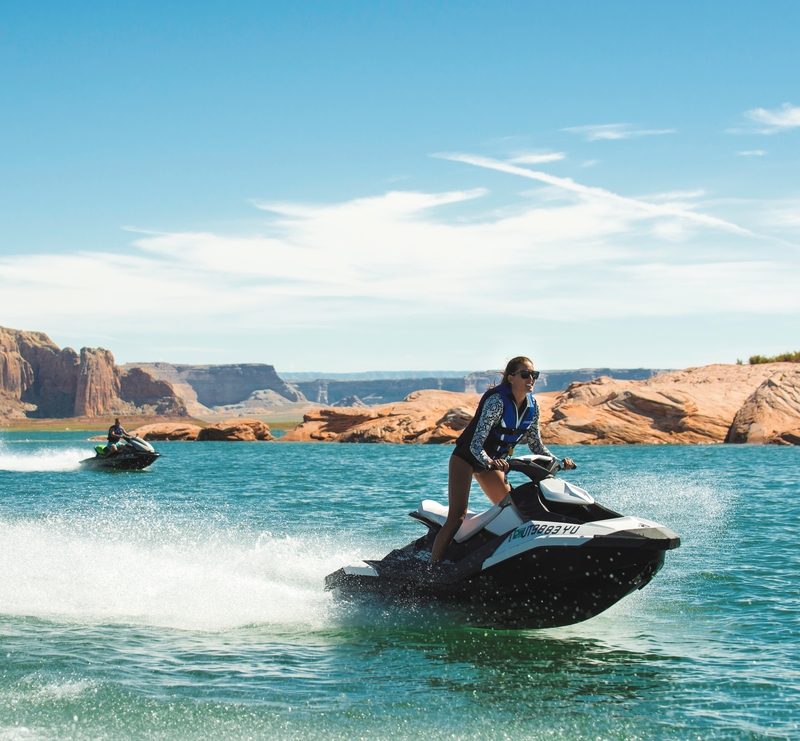 On a picturesque mesa overlooking Lake Powell, Page stands sentry to the sprawling Glen Canyon National Recreation Area – a playground for boaters, campers, and nature-lovers that encompasses more than 1.2 million acres. 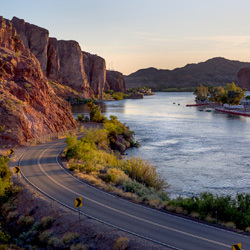 With the Colorado River meandering through Parker - creating 16 miles of watery playground called the Parker Strip, visitors can enjoy a mecca for exciting water sports like boating, swimming, and rafting. Beyond the river, you can further enjoy the golfing, dining, casinos, and the Colorado River Indian Tribes (CRIT) reservation. 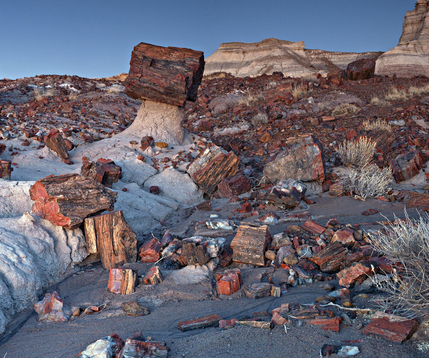 Petrified Forest National Park, near Winslow, AZ, has petrified wood, 13,000 years of human history, plus hiking, camping, and horseback riding. 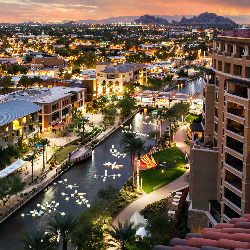 Big-league sporting events, renowned museums, and plenty of trails for biking and hiking are just the beginning in Phoenix, Arizona’s capital city. 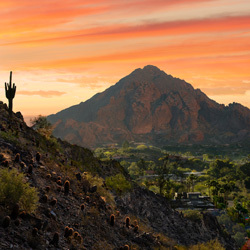 With a skyscraper-filled skyline complemented by famed Camelback Mountain, Phoenix offers the perfect balance of urban energy and Southwestern scenery. 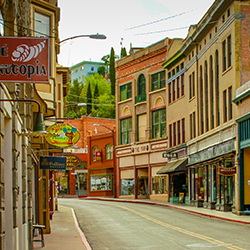 Teeming with Victorian homes and turn-of-the-20th-century saloons, Prescott is known for its Wild West past – as well as its charming present. From the 1918 Yavapai County Courthouse, downtown’s neoclassical anchor, to Whiskey Row, where Arizona’s gunslingers drank and fought. 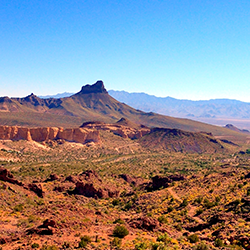 Sample the Salsa Trail in Safford, Arizona, then explore Mount Graham International Observatory, the Gila Box riparian area, and Roper Lake State Park. A panorama of unforgettable sights unfolds before you from the moment you enter this friendly town full of resorts, camping, recreation, art, and spirituality. 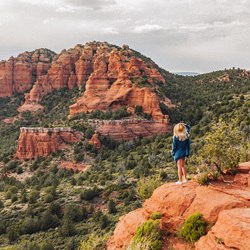 From the rich red sandstone buttes that rise above the city to nearby Oak Creek Canyon, a thickly forested gorge with a stream, this destination encourages you to jump in. 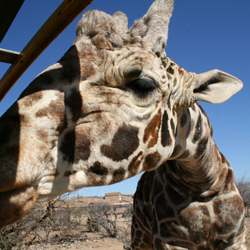 Visit Show Low, Arizona, on Northern Arizona’s Mogollon Rim, where hiking, biking, and horseback riding are the perfect outdoor adventures, and wildlife abounds. 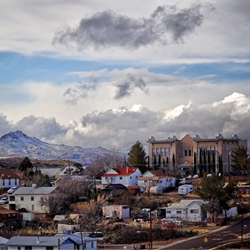 Surrounded by near-forgotten ghost towns, Sierra Vista, Arizona, is anything but dead. 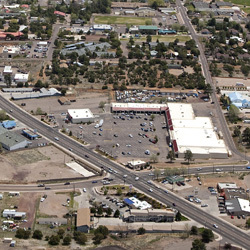 Home to busy Fort Huachuca, this small city of around 50,000 people offers visitors scenic vistas, byways, and trails – as well as a bird-watcher’s paradise of nature preserves, perfect for spying some of the country’s most exotic hummingbirds. 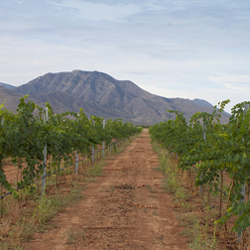 Sip local wines and explore the beauty of Southern Arizona from Sonoita, a warm, picturesque wine-growing region south of Tucson. Just west of the Arizona-New Mexico border, find St. Johns in Arizona’s White Mountains with breathtaking views, hiking, fishing, and horseback riding. 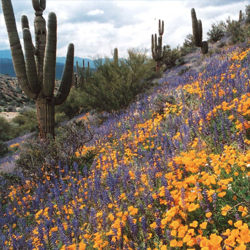 Visit Superior, Arizona, for mountain, valley, and desert exploration, as well as scenic drives, Arizona history, and Boyce Thompson Arboretum State Park. More than 130 years after its 1877 founding, the "Town Too Tough to Die" – home of the famed gunfight at the OK Corral – is still alive and well. Today, Tombstone is more tourist destination than rough-and-tumble cowboy town. Located just outside of the Coronado National Forest, centuries-old Tubac was once the site of a Spanish Colonial presidio. 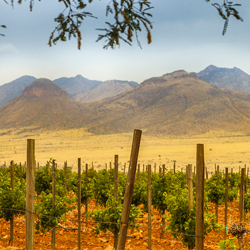 Today, Tubac is a charming artists’ community – working artists’ studios abound. Don’t miss the Tubac Presidio State Historic Park, located in the old town, and the Santa Cruz River, a top spot for Arizona birding. 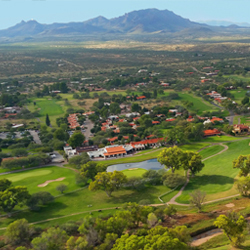 Luxurious golf courses and resorts, a flourishing art and history scene, and vivid multicultural heritage make Tucson an attractive destination for any Southern Arizona vacation. 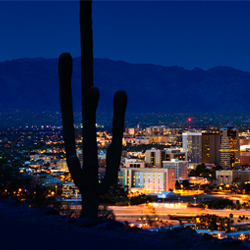 Home of the University of Arizona, this mid-sized city also plays host to countless fairs, festivals, and events. 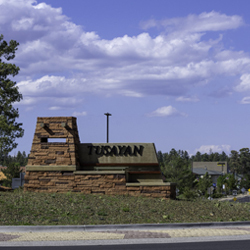 Tusayan, Arizona, offers lodging near the Grand Canyon’s South Rim and is home to Grand Canyon Airport, where helicopter and airplane plane tours depart daily. City slickers are welcome in this Western enclave – but prepare to get your hands dirty and your boots dusty. 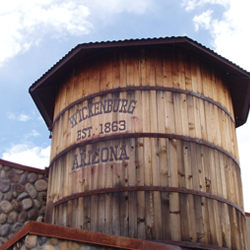 Located around 60 miles northwest of Phoenix, Wickenburg feels a million miles away from the bustle of the city. 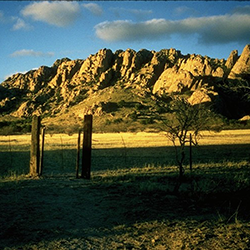 Known for its working ranches – where visitors can ride, camp, and work with real ranch hands. 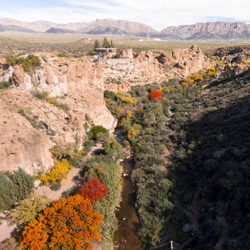 Chiricahua National Monument, migrating cranes, and Rex Allen Days draw thousands to friendly Willcox, the gateway to the Magic Circle of Cochise. The “Gateway to the Grand Canyon,” Williams is perched at the end of the century-old Grand Canyon Railway line, which makes daily trips to the park’s South Rim. But Williams is also a destination in its own right, offering a hearty dose of Americana along a downtown dominated by old Route 66. 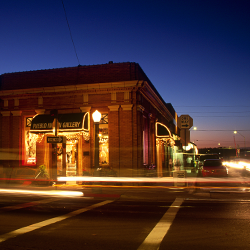 Slow down in Winslow, Arizona, along Historic Route 66 and home to the Standin’ On a Corner Park, the Old Trails Museum, and the famous La Posada hotel. 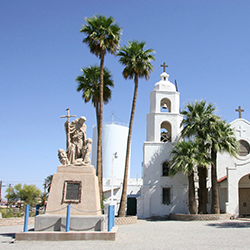 Where the Colorado River and the Gila River meet to create an oasis midst the Sonoran Desert, you'll find the wonderful Southwestern town of Yuma. 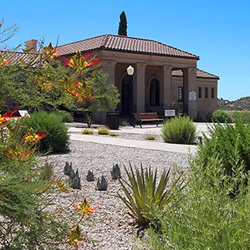 With more sunshine per year than any other city in the world, Yuma offers lots of fun under the sun from a round of golf to visiting the historic Yuma Territorial State Prison State Park. 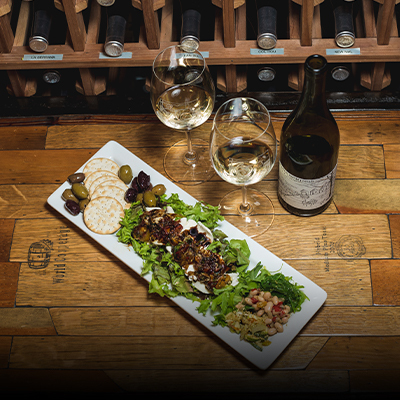 Customize your Arizona experience with hand-picked recommendations.